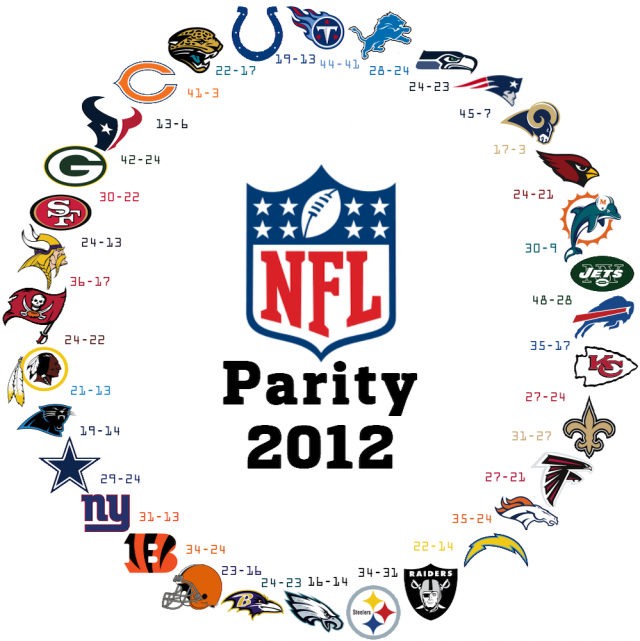 Parity in the NFL? Nope! It’s the Sample Size! It's almost Super Bowl Sunday, and this year’s matchup pits the Baltimore Ravens against the San Francisco 49ers. The 49ers are no huge surprise, as they were favored in both of their playoff games. However the Ravens had to win 3 games, pulling two major upsets along the way, to get to the Super Bowl. It marks the 8th time in the last 10 years that a team that played on Wild Card Weekend advanced the entire way to the Super Bowl. This again shows how much parity there is in the NFL. It’s unpredictable! Any team can win the championship! Well...not quite. While I agree that the NFL playoffs are unpredictable, it’s not because of parity. It’s all in the sample size. In statistics we’re always being warned about making conclusions based on small sample sizes. Small samples have wider confidence intervals, meaning there’s more variation surrounding the estimates. Therefore, it’s harder to make conclusions based on them. If we want to determine whether a new ice cream flavor tastes good or bad, would we sample one person and base our conclusions on their opinion? Of course not! We’d sample multiple people and determine the proportion of people who thought it was good. The NFL playoffs try to determine the “best team” by taking a sample size of 1 game and having the winner advance. So of course there is going to be a ton of variation in the results! And this makes it appear that just about anybody can beat anybody else, and thus the idea of parity. But what if we increased the sample size? What Would the NFL Playoffs Look Like with a 7-Game Series? Let’s determine how much of a difference a 7-game series would make in the Super Bowl compared to a single game. The first thing we have to do is figure out each team's probability of winning the game. To do this, I’m going to use the final Las Vegas betting spread on the game. Now, I know the spread is not set by casinos to predict the most likely outcome but instead is meant to estimate where they can get 50% of bettors to take one team and 50% to take the other. I am going to use it anyway, because it turns out there is usually little difference between the two. So let’s say the spread is 0. That means that teams are evenly matched and each has a 50% chance of winning. But the spread in the Super Bowl has the 49ers favored by 3.5 points (at the time of this writing). Obviously this means they have greater than a 50% chance of winning the game, but by how much? 55%? 60%? Luckily, the site thepredictiontracker.com has tracked the outcome of every NFL game against the spread. You’ll see on that page that the Mean Square Error for the spread (called “Line (updated)”) is 194. This represents the variance in the spread. We can take the square root to get the standard deviation, which is 13.9. 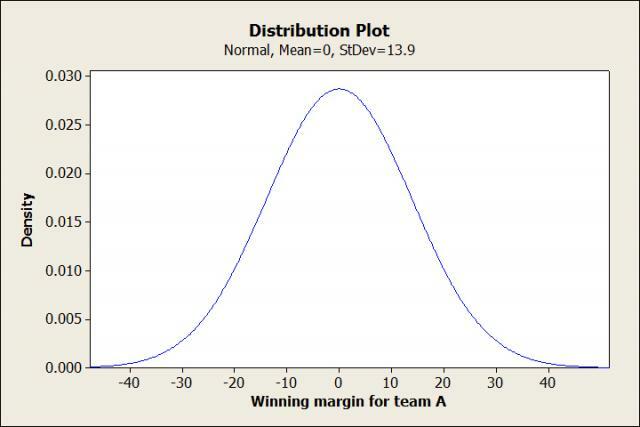 We can then use Minitab to make a normal probability plot of the distribution, and use the area under the curve to determine the probability a team has of winning. Okay, I know that was a lot right there, so I’ll walk through a simple example. Let’s start with a game between two teams where the spread is 0. So you’re looking at the distribution of scores between two NFL teams that are evenly matched. 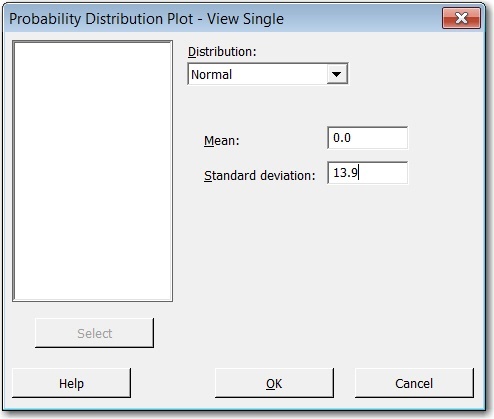 The distribution is centered at 0, since that is the spread. Any value to the right of 0 means team A wins, and any values to the left of 0 means team B wins. We can find the area beneath the curve to the right of 0 to find out the probability that team A wins. The shaded area represents all of the outcomes that result in a victory for team A. You see that when you find the area of the shaded region, you get .5. This equals the probability of team A winning, which is 50%. Now we can do the same thing for the Super Bowl, except we’ll make the spread 3.5 instead of 0. And we finally see that the 49ers have about a 60% chance of winning the Super Bowl. But what if the NFL changed it to a Super Series? That is, what if instead of 1 game, the 49ers and Ravens played a best of 7 series? What would happen to the 49ers' chances of winning then? 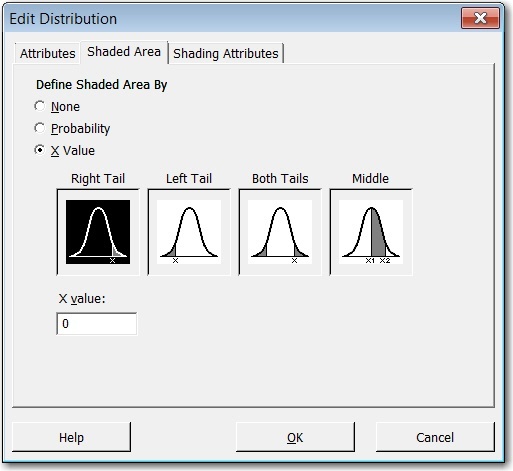 To figure that out, we are going to switch gears from a normal distribution to a negative binomial distribution. 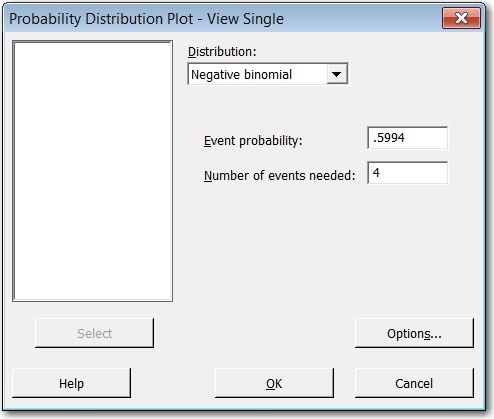 The negative binomial distribution can model the number of trials necessary to produce a specified number of a desired outcome. In this case our desired outcome is the 49ers winning 4 games (which would mean they win the series). 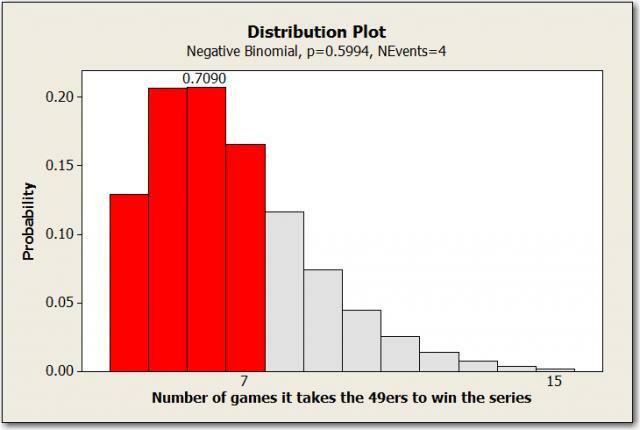 Then we find the probability that it takes them 7 or less games to do it. The Super Bowl is played at a neutral site, so we can use the same probability for each game. 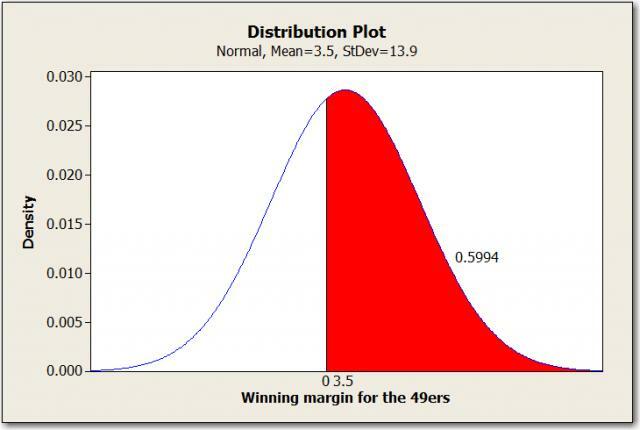 We see that the probability of the 49ers winning rises to 71% in a 7-game series. That’s a pretty significant increase! The reason being it’s a lot easier for the underdog to pull a single upset than having to do it 4 times in 7 games! Baltimore can consider itself lucky that it only has to win one game. And not just in the Super Bowl: they’re lucky they didn’t have to beat Denver or New England in a 7 game series, either! The table below shows the difference between a single game and a 7-game series for each of the playoff opponents Baltimore has already defeated. NOTE: For the 7-game series before the Super Bowl, Baltimore would play both home games and away games, which would change their probability of winning since the home field advantage is worth 3 points. I calculated their probability of winning at both home and the road, then used a weighted average (3/7 for the underdog home probability, 4/7 for the favorite home probability) to calculate a constant probability I could use for the negative binomial plot. The favored team would play game 7 at home, which is the reason I used a weighted average. The 7 games series would have helped Baltimore slightly against Indianapolis, but it would have significantly hurt their chances against Denver and New England. So as you can see, by simply changing the format of the playoffs, you can significantly alter the probabilities of who advances. The single-game format gives the underdog a much better chance of winning, and thus the appearance of parity. But let’s not stop there! As fun little example, here are the last 10 champions of the NHL, MLB, and NBA, and how their season would have ended if their playoffs had a one-and-done format. If they won the first game in their series, they advanced. Otherwise, they were eliminated. Only 2 of the last 10 NBA champions would have still won the title if they had a one-and-done format. Oh, and you remember those great Spurs teams with Tim Duncan and company? Instead of being called champions with multiple hall of fame players, they’d be a bunch of choke artists that couldn’t get out of the first round. And yet, they’d be the exact same team! Isn’t sports analysis fun? Four different Stanley Cup champions would have lost in the 1st round. And another 3 wouldn’t have even reached the finals! The NHL playoffs seem like a crapshoot as it is (only 1 repeat champion in the last 10 years), so I can’t imagine the chaos that would result from a one-and-done format. Six of the last 10 MLB champions wouldn’t have even reached the World Series if they had a one-and done. And keep in mind they only had to win 2 games to get to the championship, unlike basketball and hockey where they have to win 3. And the Red Sox would have had to wait until 2007 to break the curse of the Bambino! Assuming, of course, the city wouldn’t have imploded after losing to the Yankees yet again in 2004. So if you’re keeping track at home, a mere 7 out of 30 champions would have still won with a one-and-done playoff format. That’s a solid 23%. How About this Sample Size? Over the past 10 years, the Yankees have a winning percentage of .596 during the regular season. Five different NFL teams have a winning percentage above that over the same time period. The teams are the Ravens (.606), Packers (.613), Steelers (.644), Colts (.700) and Patriots (788). In fact, over the past 10 years the Patriots have gone 126-34 in the regular season. The MLB record for most wins in a season is held by the 2001 Seattle Mariners, who went 116-46. So in their last 160 games, the Patriots have won 10 more games than any major league baseball team ever, and the Mariners had 2 extra games! How about the NBA? Over the last 10 years the Spurs have the highest winning percentage at .706. Yea, that same Spurs team that’s great during the regular season then chokes in the playoffs (at least in a bizzaro world). That’s pretty good, but it still doesn’t beat the Patriots. In fact, even 10 years of the Jordan-era Bulls (1989-1998) doesn’t beat the Patriots. They only had a winning percentage of .722. And taking the Bulls regular season record during the 6 seasons they won NBA championships, you get a winning percentage of .789, which just barley beats the Patriots. If the NFL playoffs played 7 game series, who knows how many championships New England would have! And you think you're sick of the Patriots now! So next year, when you will most certainly see upsets in the NFL playoffs, realize that it has nothing to do with parity. Yes, on any given Sunday, anything can happen. But 4 out of 7 Sundays? That would be a completely different story.